Power Foods is a recipe book featuring some of the healthiest foods on the planet. It was compiled by “Whole Living” magazine, a Martha Stewart publication. Martha Stewart says, “Healthy eating doesn’t have to be a challenge. It should be easy and it should be pleasurable.” The foods featured in this book were chosen because they contain outstanding amounts of vitamins, minerals, phytonutrients, essential fatty acids, and more, and have a proven track record of preventing disease and supporting good health. Readers are introduced to the health benefits and disease-fighting properties of thirty-eight “power foods”. The first section of the book also includes nutritional information about each food and advice on how to select, prepare and store them. The foods are listed by category: vegetables, fruits, grains and legumes, nuts and seeds, eggs/yogurt and fish. Ten “golden rules” are outlined to help you follow a healthy diet. Select a wide variety of natural foods. Shop locally and eat seasonally. Eat a rainbow of colorful fruit and vegetables. Buy grains, nuts and seeds in bulk. Use organic low sodium broth, or prepare broth from scratch. Plan ahead and shop wisely. Fill half your plate with vegetables, a quarter with whole grains and a quarter with lean protein. Following this are the recipe chapters, which include breakfast, snacks, sandwiches, soups, salads, main dishes, side dishes and desserts. The instructions are simple and the book features color photographs of the recipes. Examples of some of the recipes included are Pecan Pancakes with Mixed Berry Compote, Sweet Potato Hummus, Curried Egg Salad on Multigrain Bread, Golden Pepper Soup, Chili with Chicken and Beans, Quinoa and Corn Salad with Pumpkin Seeds, Citrus-Roasted Salmon with Spring Pea Sauce and Double Dark Chocolate and Ginger Biscotti. Asparagus, artichokes, avocado, beets, bell peppers, broccoli, Brussels Sprouts, carrots, kale, mushrooms, spinach, sweet potatoes, swiss chard, tomatoes, winter squash, apricots, berries, citrus, kiwifruit, papaya, pears, brown rice, oats, quinoa, dried beans, green peas, soybeans, almonds, pecans, pistachios, walnuts, flaxseed, pumpkin seeds, eggs, yogurt, sablefish, rainbow trout, wild Alaskan salmon, olive oil, canola oil. Power Foods is a recipe book so therefore does not include exercise recommendations. 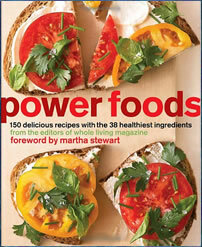 Power Foods: 150 Delicious Recipes with the 38 Healthiest Ingredients retails at $24.99. Encourages the intake of a wide variety of natural foods, preferably organic. Contains unique information about the health benefits of the 38 “power foods”. Basic nutritional analysis is provided for the recipes. Recipes are simple to understand and follow. Based primarily on everyday ingredients that can be found in regular grocery stores. Many of the recipes are suitable for those following a gluten-free diet. Will not appeal to dieters who don’t enjoy cooking. Some of the recipes include unhealthy ingredients such as sugar and refined flour. Organic produce is more expensive. Exercise advice is not included. Is not a complete weight loss plan. Power Foods is a cookbook that can help you to effortlessly increase your intake of healthy foods without feeling deprived. It contains a wide variety of recipes for familiar items like muffins, pancakes, sandwiches, salads, main dishes and desserts, as well as a selection of ideas for healthy snacks. This book will appeal to dieters who want to learn more about the health benefits of the foods they are eating and enjoy spending time in the kitchen.